Home > Pet > Which is the best dog family protection dog for My family? This is a question that is often asked and the answer isn’t so straight forward. We first have to look at your family structure and lifestyle. We then not only consider the breeds as a type but also the personalities of each dog. German Shepherd:- Great utility / adaptable dog for all environments. Within the German shepherd breed you have very different lines of genetics and this is the challenge to select the right dog, if indeed the German shepherd is the right dog for you. Even within the “working” German shepherd lines you can get very different dogs. We feel that a low drive dog who is sensitive to the handler / owner / family is the ideal choice, they are serious in their work and reliable protective companions. 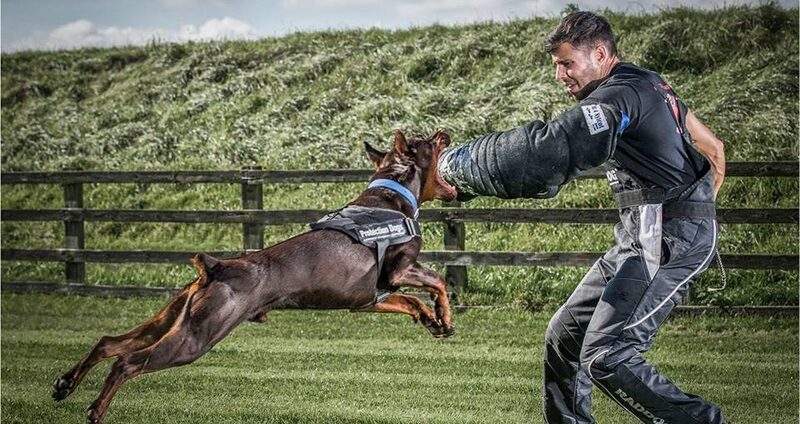 Doberman:-The iconic protection dog which is not only functional but also strikes an impressive figure. The demand for the Doberman is high and selecting the right dog is an art form. Owners need to often consider that the breed is slow maturing and needs to develop within the family; they do however, offer lots of affection and love to be with you. Their short coats are easy to maintain and in many ways they are an ideal house dog. Cane Corso:- These dogs were born to protect their home and family. Once again selecting the right dog is the key to success the breed is still relatively new and without the right genetics can be prone to nerve issues. They are slow to mature with low drives (although you do get the exception). They are happy to sit around the grounds looking after the family, but if you are into long hikes then this breed might not be for you. Rottweiler:-At Protection Dogs Worldwide we only do these to order, they are a specialist breed that can and do make formidable family protection dogs. They love to work and have power in abundance. Their short coats are easy to maintain and they are happy to live in or outside. Giant Schnauzer:- A working giant is indeed a wolf in sheep’s clothing, they give a softer image but without question they excel at being a family protection dog. They are large dogs which like to be active and require grooming to keep their coats in order. They can be a good alternative for those with allergies. As the breed is relatively small you need specialist knowledge and understanding of the breed to select the right dog with the right genetics. At Protection Dogs Worldwide we supply these dogs to order. Our advice to any new owner, have a think about your breed preference, your lifestyle and what you want to get out of owning a dog and what lifestyle you can offer a dog. Come and visit with a open mind and first and foremost see the dog as a family pet.